Many of us learned about Pavlov's dog experiment in school. A very basic instinct of reward or punishment that creates learned behavior. Do something good and you get a "Scooby snack" (or marathon medal.) Do something that elicits pain and you're not likely to do it again. While cooking dinner for the family Sunday night, the timer went off on the oven, but I was busy doing other things (grilling burgers and brats.) I realized I ignored the timer long enough and opened the oven to reveal the dessert had gone from the desired light golden brown to darker brown on the edges. Not wanting to ruin the meal, I grabbed a wet towel nearby thinking a cold wet tower equaled an oven mitt. This is why they created the "Darwin Awards" as only a man would use such logic. My favorite Darwin Award is the guy who decided to use a chair with wheels to water his plants on his high-rise apartment patio. You know how that one ends. While I'm used to having blisters on my feet (and a few missing toenails,) my soft "white collar" hands are not. I am sporting blisters on my supple finger tips today. While I should have learned not to grab a hot pan as a child, apparently, I'm still learning. Pavlov would be confused about the hot pan and further confused on why I keep self-inflicting run pain. This brings me to my latest training plan for the Slacker Half Marathon on June 22nd. 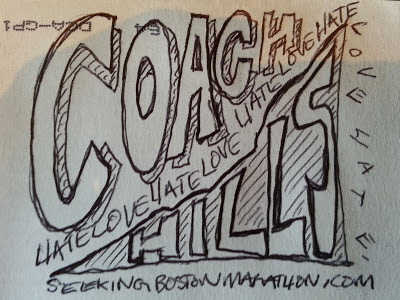 As I've written here often since the Boston Marathon in April, I seem to have found the right coach and the right training plan as Boston was my first mary where I had uncanny energy in the last five miles. At this point, if coach Benita asked me to grab a hot pan with a wet towel, I wouldn't question her. While I understand the logic on most of the workouts she throws at me; intervals, tempo, slow recovery, and progressives, I occasionally raise an eyebrow over the workout that pops up in my daily email. Let's start with the fact that the Slacker (is anything but that and) is a (Rocky) mountain DOWNHILL course starting at the Loveland Ski area (at 10,660 feet) and ends in the mining town of Georgetown (elevation 8,525 ft.) Makes sense that I would be doing a lot of downhill training with my Slacker training plan. Coach "crazy" has had me doing hill work alright; UPHILL speed workouts. Not just hill training, but intervals at 5K pace and faster. This is the point where I love my coach and (mildly) hate her at the same time. Not hate in a literal sense, but perhaps in the way a wife tells her husband that she hates him and his (man weapon) while giving birth in the delivery room. 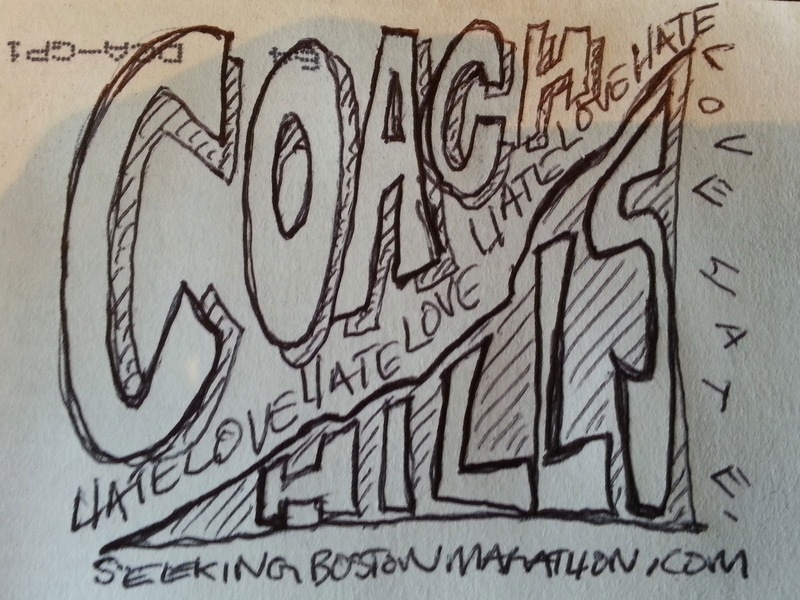 I really don't mean these thoughts I'm cursing under my breath while racing up a hill these last three weeks. With the half marathon right around the corner, my confidence is building. My Tuesday morning speed work was not uphill, nor downhill, but she wanted me to push below a 6 minute per mile pace on my last set of 4 x 45 seconds. I didn't run them at a six minute per mile pace...I pushed it to a 5:30 pace and could have run faster. I take back all the things I said during those hill workouts. Thank you sir, may I have another. Authors Footnote: For the female readers, please don't send me (complaint)email regarding my comparing a marathon or training for one to childbirth. No, 1) I'm not a woman, 2) have not delivered a baby (see #1,) but 3) I did have a part in two conceptions and witnessed aforementioned writhing and birth-delivery name-calling. LOL sorry to take up so much room in your comment box but as a woman who has given birth (without drugs) I am not gonna give you grief about your childbirth comparison. I did it recently related to a race a lot shorter than a marathon or half, and got a snotty remark from a fellow woman about how "it's not as bad as childbirth" - I guess the ways in which women can be unnecessarily snotty to one another is a topic for a different post but here's what I said (and this was a prediction run hence the no watches, etc.). Good luck with your Slacker. Not positive about the time - I caught a quick glance at the clock once I finished (no watches during the race). Thought often about the parallels between this race and childbirth: you really don't have any mile markers. In this case we actually didn't have a clear start (except to start when the band stopped playing...long story). Just when you have relaxed (downhill) the process hits you with a b**ch of an uphill. You think you're getting close to the end, you think you can't take one. more. step. when voila! more trail stretches out before you. BUT there is a finish. You look back behind you and realize you did it but it took longer than you thought it would (or shorter ... but never exactly what you predicted). Then after saying for almost an hour how you have no clue why you got yourself in that position, you have a nice relaxing drink and begin thinking about how the next one will go and how you wouldn't miss it for anything. Thanks for the reply Paula. I knew I could get into trouble weaving in child delivery and marathon running in the same sentence. Perhaps a poor analogy, but more of a comparision of how we think or say things we may not mean during something painful, then afterwards as you point out...it's all worth it. Some of the things that come out of my mouth during hard workouts....good thing running can't hear or it would truly think I am the devil.